The High Court also directed the State Government to ensure that all FIRs be uploaded on the website of the U.P. Police, except in exceptional circumstances. The Bench, comprising Chief Justice D.Y. Chandrachud and Justice Yashwant Varma directed that the decision to not upload the FIR should be taken by an officer not below the rank of Superintendent of Police, after recording the reasons in writing. The Court held that the Armed Forces Tribunal has no jurisdiction over a dispute which arose prior to the enrolment of a person into the Armed Forces. The first bench comprising of the Chief Justice Dr.DhananjayaYeshwantChandrachud and Justice YashwantVarma, set aside the order of single bench who had allowed the proceedings to be transferred to Armed Forces Tribunal. In a bail application moved by persons accused of slaughtering cow, which is a crime punishable with 7 years imprisonment in Uttar Pradesh, the High Court, apart from granting bail to the accused, issued directions to the Government authorities and the cattle owners to ensure that no cows or animals come on road creating obstruction to traffic and threat to life. The Chhattisgarh High Court held that the policy of the State Government barring and prohibiting the consideration of the married daughter from seeking compassionate appointment merely on the ground of marriage is plainly arbitrary and violative of Article 14, 15 and 16(2) of the Constitution of India. The High Court bench of Justice Suresh Kait dismissed the plea of Dabur promoter PradipBurman, whose name has appeared in the blackmoney list, seeking to stay proceedings in a case of alleged tax evasion against him in the trial court. Burman is facing prosecution in a complaint filed by the Income Tax Department alleging that he was holding foreign bank accounts which he had not disclosed in his income tax returns and there were undisclosed deposits in those accounts. He had challenged the trial court’s order by which his plea for staying the proceedings was dismissed. Gujarat High Court quashed the FIR lodged against PatidarAnamatAndolanSamiti (PAAS) convener Hardik Patel and others pertaining to charge that they were involved in an act of Treason (Waging war against the nation Section 121 IPC). The court, however, has allowed the investigation against the agitators to continue so far as the sedition cases against them is concerned. The Court held that Complaints under Domestic Violence Act can be quashed invoking the jurisdiction under Section 482 of the Code of Criminal Procedure. The first bench comprising of Acting Chief Justice Jayant Patel and Justice N V Anjaria held that even though the provisions of the Domestic Violence Act provide for remedial measures for civil rights of women, the machinery provided is through criminal court and hence the Code of Criminal Procedure would apply. 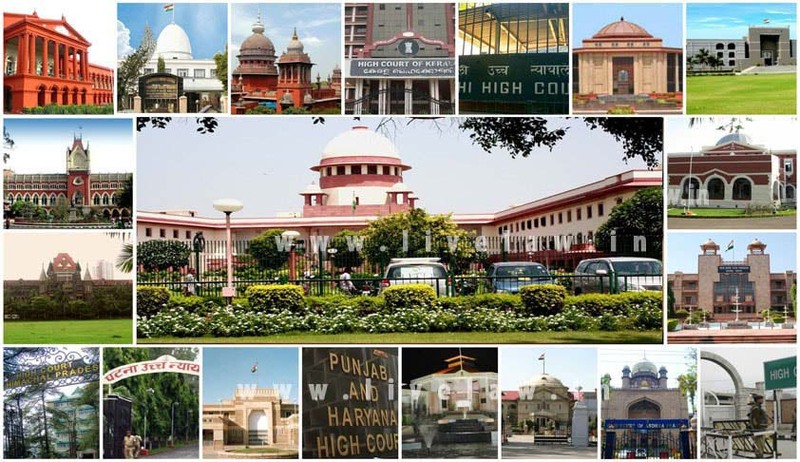 The High Court directed the State Election Commission to make available all the Poll affidavits online, through the website of the commission, within six months. First bench comprising of Acting Chief Justice Jayant Patel and Justice Vipul M. Pancholi said that such a facility would help the voters to take appropriate decision at the time of voting. The High Court of Himachal Pradesh came down heavily on a newspaper, for indulging in repeated misquoting and misreporting of the orders. A Division bench of Justices Rajiv Sharma and Sureshwar Thakur said that newspapers must report an order of the Court as it stands, instead of creating sensation. The bench has also directed the registry to draw contempt proceedings against the local correspondent of the daily edition of The Tribune and to issue notice. The High Court held that right to free and compulsory education in a neighbourhood school envisaged section 3 of the Right to Education Act does not include the right to insist on getting admission in school of one’s choice. The first bench comprising of Chief Justice Mansoor Ahmad Mir and Justice Tarlok Singh Chauhan, dismissing the Writ petitions preferred by parent of a students, held that private unaided recognized School Management has a fundamental right to maximum autonomy in day to day administration including their rights to admit students. In a Public Interest Litigation filed by Shri AbhishekGilke, a law student from Devi AhilyaVishwavidyala, Indore praying compensation from various authorities of the state government to be paid to a widow for loss of life of her husband Late Vishal Mandloi who succumbed to heart attack being caught in a traffic jam, the Indore Bench of the Madhya Pradesh High Court issued directions to the government to award appropriate compensation to her. A contempt petition filed against Chief Justice of Madhya Pradesh High Court was dismissed by the High Court on Tuesday. A petitioner in PIL had filed the application alleging that certain utterances made by the Chief Justice A.M. Khanwilkar, while hearing the writ petition amounts to contempt. However the Division bench of Justices RajendraMenon and K.K. Trivedi, who heard the application, said that the act of the Chief Justice as alleged in the contempt petition cannot be termed as contempt of Court. In a recent judgment, the Madras High Court prescribed a dress code for men, women and even children to visit temples maintained by Hindu Religious and Charitable Endowments (HR and CE) Department across the State. Justice S. Vaidyanathan gave the above direction in a Writ Petition filed by Mr.Rasu seeking to quash the order of the Sub-Inspector Thuvarankurichi Police Station, Trichy declining to grant permission to conduct GramiyaAdalPadalVizha (village cultural programme). The petitioner had sought for permission and police protection to conduct the same at Sri ShenbagaVinayagar temple premises in Trichy district. High Court of Sikkim set aside an order by Family court which had enhanced maintenance to ‘son’ who had attained majority. On the Revision petition filed by ‘Father’, Chief Justice Sunil Kumar Sinha, held that provisions of Section 127 of Code of Criminal Procedure are always subject to the provisions of Section 125 and as the major son, ceases to be entitled to receive maintenance under section 125, he cannot seek an order of enhancement under section 127.